This is the fourth article on CFS and Myalgic Encephalomyelitis prayer. Please join your mind with all who visit here. On this page I primarily use the term Myalgic Encephalomyelitis (Over time, I have been given this diagnosis, the diagnosis of CFS and have been mapped for Fibromyalgia). Please feel free to adapt the prayers to include the diagnosis you have been given. Prayer for guidelines that accurately represent the needs of a person with Myalgic Encephalomyelitis/CFS. I promise to use it only to send you Healing CFS/ME. We pray for journalists in the media. 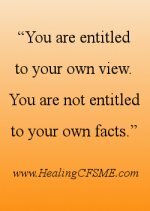 Guide journalists to be wise and compassionate in their writing about the ME/CFS community. Guide them to do their research. We see them experiencing the satisfaction of accurate representation. We pray for all those of us with ME/CFS who are on social media. Let us share information which allows people to meet those with this chronic illness with compassion and understanding. We see the power of words changing lives for the better. Any time we feel we are sending out frustration at media coverage, we honour that feeling of frustration and then choose to the best of our ability to send a blessing. We hold a vision for a world that accurately represents this chronic illness. We see a world in which our emotional health is eased by accurate communication and the receiving of appropriate understanding and support. We pray for all those involved in the compilation of guidelines such as the NICE guidelines. Guide them in all wisdom. Thank you. It can feel so lonely to feel ill. I would like someone to be here with me. Or perhaps someone is here with me but I feel lonely with them. I can’t say how ill I feel because they might be bored of hearing it. Or they might tell me to be positive. Or they might tell me I am complaining about nothing and I would feel more lonely. Sometimes, even I don’t like hearing myself noticing the symptoms! Guide me to give myself the understanding I need. Bring into my life someone who soothes me with their understanding. My God, I place any symptoms I have on your altar. I place any loneliness I feel about those symptoms on your altar. I don’t know how to feel OK in this situation, but I am doing my best to create a space in the clutter of my mind and to invite you in. I am willing to have a sense of my oneness with you. I am willing to know myself to be at one with every living thing. Speak to my mind, God. Speak to my heart. Let me know your love for me. Give me a sense that you are here with me. Give me the strength I need for this moment, and the next 5 minutes, and the day ahead. Thank you that you are the Love behind all things. Thank you that I am and always will be a part of you. To the best of my ability, I let go of my sense of separation. I let go of my littleness. I affirm my connection with you, my unity with you, my wholeness in you. I remember also that others are reading and relating to this prayer. I am not alone in this experience of loneliness. and into the life of anyone I think of now. Thank you so much for praying one of these prayers for Myalgie Encephalomyelitis / CFS support. Your time, your voice, your faith - small or big - are so appreciated. Prayer for a family member or friend of someone with Myalgic Encephalomyelitis. Visit another website for spiritual quotes about loneliness. You will find many more prayers, as well as articles on forgiveness, love, inner peace and meditation. 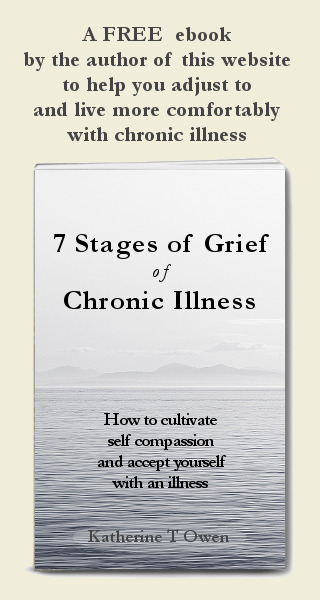 Also ME/CFS articles about my journey with this chronic illness at a very severe level. Click here for a prayer asking for healing from Myalgic Encephalomyelitis /CFS. a mug, cushion, postcard, coaster, T shirt etc. Use one of my designs or start from a blank. © Katherine T Owen. All articles on this website are copyrighted. I am delighted if you choose to click above to share this page on social media, but please do not copy, print or otherwise use without my permission. Thank you. Disclaimer: I am not a medical practitioner. The articles on this website are not to be taken as medical advice. Please consult a medical practitioner as necessary. Re-verse -An evening of thought-provoking poetry contemplating life and spirituality.